Rendell, of the 3rd Circuit Court of Appeals, is co-founder and president of the Rendell Center, which focuses on civic education in elementary school. City Council also honored the Annenberg Public Policy Center of the University of Pennsylvania, home of the Rendell Center, which partners with the Rendell Center on activities and is dedicated to civics education among middle- and high-school students. The City Council resolution, sponsored by Councilman Kenyatta Johnson of the 2nd District, lauded the Rendell Center for some of its best-known initiatives, including forums in 2015 for students to talk with Philadelphia’s mayoral candidates and the center’s annual Citizenship Challenge, an essay-writing competition on civic topics. 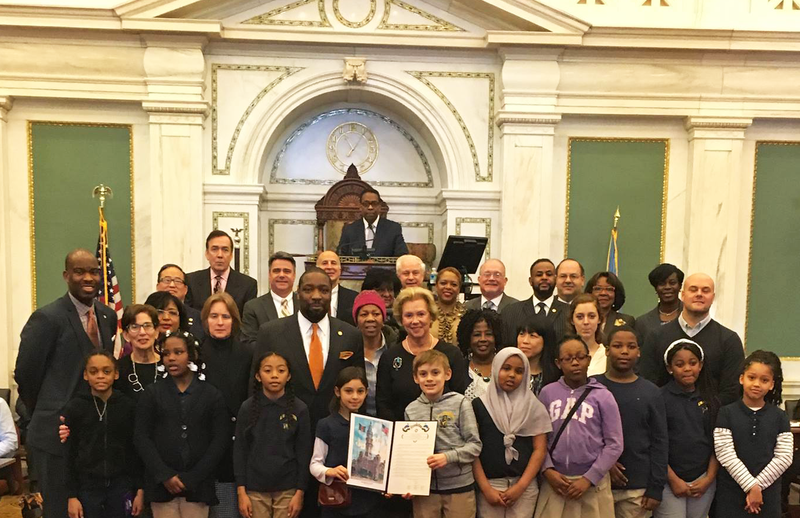 At the City Council presentation in February, Rendell was joined by students from E.M. Stanton Elementary, the center’s pilot school. Judge Rendell, joined by students from E.M. Stanton Elementary. The Rendell Center for Civics and Civic Engagement, founded by Judge Rendell and former Pennsylvania Gov. Ed Rendell, promotes civic education and engagement by helping educators and students to develop the knowledge, practices and dispositions of engaged citizenship. The Center works to develop curriculum, create events and spaces for engagement with citizenship, and host professional development opportunities for educators. From July 17-22, the Rendell Center will be holding its Constitutional Scholars Institute, a five-day program in Philadelphia for teachers to explore the impact of the 2016 presidential election. Scholarships are available. For more information, click here.